This edited article about Darwin in Australia originally appeared in Look and Learn issue number 757 published on 17th July 1976. It was on Christmas Day, 1974 that a hurricane named Tracy hit the northern coast of Australia and virtually wiped out the 27 square mile city of Darwin, chief port and administrative centre of the Northern Territory. The rest of the world was shocked at the extent of the damage, although most people had to reach for a map in order to discover exactly where Darwin was. Gone were the 1930s when it had been well known as the goal of daring round-the-world flyers, even though the name was familiar. Probably, people surmised, it had been named after Charles Darwin. But had the great British naturalist ever been as far afield as Australia? The doubts were not surprising, for few associated photographs of a bearded 80 year old with the young man of 22 who had made one of the most significant voyages of all time. This was a voyage to the New World in 1831. 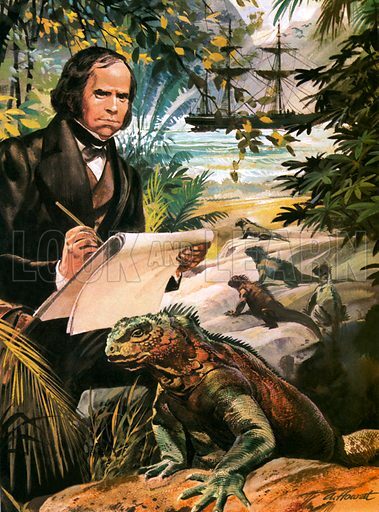 With the help of an artist, Darwin’s task was to record and obtain specimens of the plant and animal life of the countries visited, and for the next five years he worked with enthusiasm as the Beagle, on which he was travelling, slowly made her way along the coasts of South America and onwards to lands that were still mentioned very hazily in even the best geography books. Tahiti, the Maldives, Keeling Island, Tasmania, New Zealand, Australia, Darwin saw them all, and as he noted, collected and catalogued his specimens a new and extraordinary conviction began to form in his mind. It had begun to grow after his visit to the Galapagos Islands, where he had light-heartedly ridden on the back of a giant tortoise and faithfully logged its speed as 4 miles per day. The islands abounded in a number of different types of finch, each specially equipped by nature for a particular task. On one island the birds had strong beaks for cracking the local nuts, on another they had small beaks for catching insects. There were woodpecker-like finches, and fruit-eating finches and even one that dug grubs from holes with a cactus spine. It seemed to Darwin reasonable to suppose that they had evolved, and adapted their shape over the centuries in order to suit their surroundings. This edited article about Dunrobin Castle originally appeared in Look and Learn issue number 757 published on 17th July 1976. 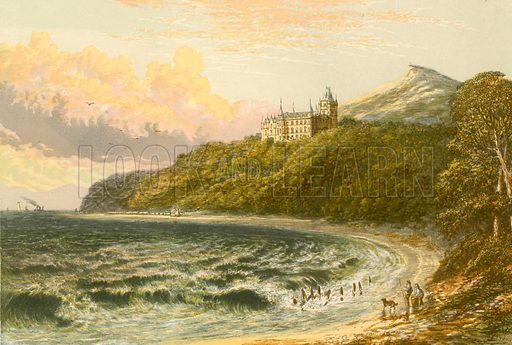 An excellent example of the Scottish baronial style is Dunrobin Castle, which is perched on the edge of an escarpment looking south over the North Sea. Constructed of elegant stone, it has balustraded terraces and stairways which were designed for the steep slope on which it stands by Sir Charles Barry in the mid-19th century. These provide vantage points from which visitors can see the elaborate parterres with their beautiful flower beds and paths running between them. Three separate parterres have been laid out on level ground, each having its pool and fountain as a central feature and beds lined with box shrubs. More cones and mop-heads of box accent the design and each parterre has its own special shape. One is circular and the other two are rectangular. These are separated by dense belts of shrubs. Today they are planted with free-flowering floribunda roses, and a long border beneath the terrace wall glows with colour from perennial plants that delight the eye. This edited article about Arctic exploration originally appeared in Look and Learn issue number 757 published on 17th July 1976. Towards the end of the 19th century, the attention of the world had been attracted to the expeditions of the polar explorers, such as Nansen and Peary. One who is perhaps not so well known but deserves special mention is the one that was led by Prince Luigi of Savoy, a prince of Royal Italian blood, who was already famous as a fearless explorer, who had climbed the Ruwenzori Mountains, among the highest in Africa, and had also been the first to conquer Mount St. Elias in Alaska. 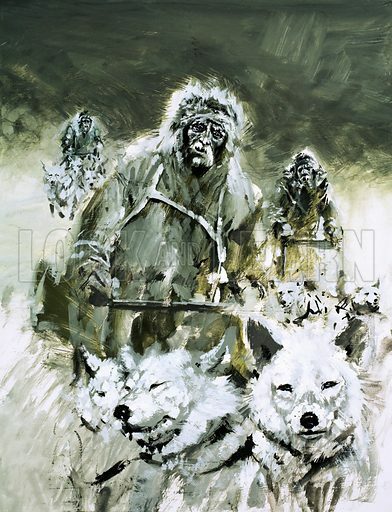 Having succumbed finally to the beckoning finger of the north, which had already summoned so many to the Arctic, he sailed from Archangel in 1899, bound for Franz Josef Land. His ship was the Stella Polare, a steam-driven Norwegian sealer. As the weather and ice conditions seemed to be in their favour, an attempt on the North Pole itself seemed possible. The Stella Polare managed to get as far as Cape Fligeli and then the ice closed in on her. It was decided in the circumstances to spend the winter months in Teplitz Bay. Prince Luigi had intended to lead a party northwards, but severe frost-bite, leading to the amputation of a finger, prevented him from taking part. He therefore gave over his command to Lieutenant Cagni of the Italian Navy, who was backed initially by two supporting parties. Tragedy struck when one of the parties, consisting of a lieutenant and two sailors, turned back – and was never seen again. This edited article about the Borgias originally appeared in Look and Learn issue number 757 published on 17th July 1976. They were brutal, bloodthirsty but brilliant, and they burst upon Europe with a speed and suddenness that was to take the civilised world by storm. Their name was Borgia, the most notorious, the most despised, the most envied, the most spectacular family of the Italian Renaissance. In their sinister chess game of political intrigue there moved one pawn: the beautiful Lucrezia, daughter of Rodrigo Borgia (later Pope Alexander VI), and sister to the infamous Cesare whose name has become synonymous with treachery, cruelty and corruption. Throughout her early life, Lucrezia was caught up in a web of intrigue so intricate, so savage and so cold-blooded, that she emerges as one of the most tragic figures of the exciting, turbulent era in history which we call the Renaissance. 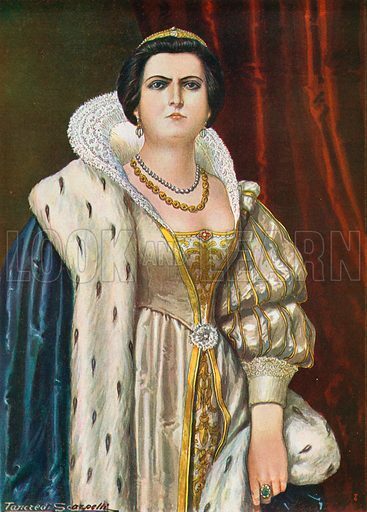 She was born on April 18th, 1480, and taken from her mother at a very early age to be entrusted to the care of a young cousin of her father’s, Adriana Orsini. She grew up, surrounded by the cream of Rome’s nobility, and received a perfect education in style, manners, culture and religious piety. At the age of 13 she was married to the middle-aged widower, Giovanni Sforza, Count of Cotignola and Lord of Pesaro, whose uncle was the Duke of Milan. The wedding took place just ten months after her father had secured the Papacy. This edited article about Lord Nelson originally appeared in Look and Learn issue number 757 published on 17th July 1976. The post-chaise rattling through the countryside, heading towards Portsmouth, carried inside it a physically broken man. Torrid suns and fever, to say nothing of constant bouts of sea sickness in all parts of the globe, had worn his frame to a shadow. At Corsica he lost an eye, at Teneriffe an arm. He carried battle wounds in his head and in his side, and what with one thing and another, should have been pensioned off by a grateful nation to enjoy the rest of his life in peace at his country residence at Merton. Instead, Admiral Lord Nelson, the idol of the British people, was off to fight the French in the Victory, one of the largest ships of her generation. An enormous crowd waited at Portsmouth to do him homage. Almost without exception, they had tears in their eyes as they watched him pass. The reason for the crowd’s emotional reaction to him went beyond the usual sort of hero worship given to national heroes, and was summed up aptly by the historian Robert Southey. 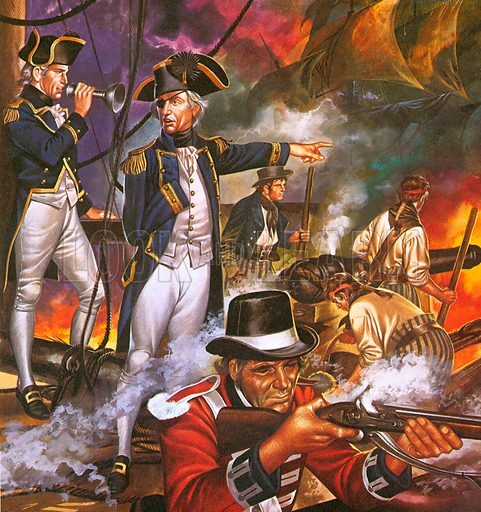 Nelson, who was not above enjoying his role as a hero, commented as he went aboard: “I have had their hurrahs before. Now I have their hearts.” And with that, the battered, one-eyed, one-armed admiral went aboard his ship and sailed away, taking the hopes of England with him. The fate of England did indeed lie to a great extent in Nelson’s hands. Napoleon was now master of Europe, and only the sea power of England remained as an obstacle to his ambition. For two years Nelson had been in the centre of the vast military and naval drama, a drama which was to reach its climax in the sea battle in Trafalgar Bay. This edited article about the Home Front originally appeared in Look and Learn issue number 757 published on 17th July 1976. Britain will win! No one had any doubt about it. In every single week of the Second World War, the message was pumped out until the truth of it was ingrained in every Briton. So it was that if you spoke to your next-door-neighbour in even the most terrible months of the war, about the bombings, the sleepless nights, the rationing and the shortages, you did not commiserate with each other about the short amount of time you might have left to live. You simply both agreed that it would all come right in the end and that Britain would win. This attitude stemmed from the fact that when the war began, Britain was still a major world power and, in the eyes of the British, the major world power. 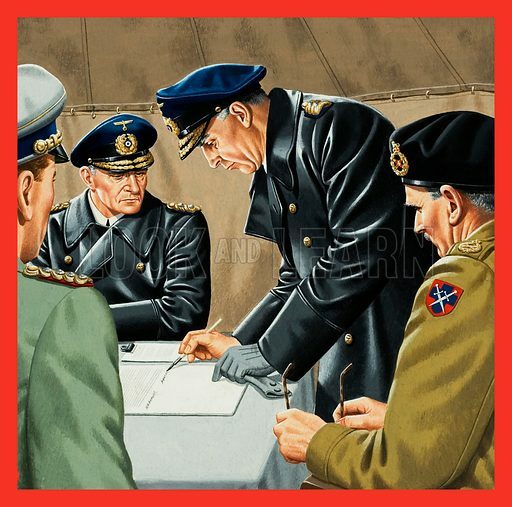 The hard truth, that the nation was no longer the rich power it had been, had still not come home to roost, so that when war was declared, Britain was seen as the land of fair play and decency standing up to the German bully. It was this intense patriotism, inspired by an absolute belief in themselves, that helped the British to win the Second World War. This edited article about Bertrand du Guesclin originally appeared in Look and Learn issue number 757 published on 17th July 1976. Bertrand du Guesclin, one of France’s most famous warriors who was raised to the rank of Constable, the highest position in the land, died on July 13, 1380. Bertrand came of a noble but poor family, and his one ambition was to become a great soldier. When he was 14 years old his father went to a jousting tournament and the boy secretly followed on a pony. 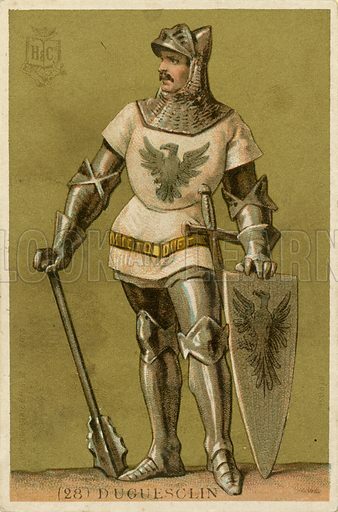 When the first knight in the tournament was defeated, Bertrand begged to borrow the knight’s horse and armour. The request being granted, Bertrand returned to the jousting and defeated 15 adversaries in quick succession. When his father challenged him, the “unknown knight” refused to do battle, but was finally persuaded to identify himself. It was the beginning of a career in which he made himself the idol of the whole of France. This edited article about John Kay originally appeared in Look and Learn issue number 757 published on 17th July 1976. 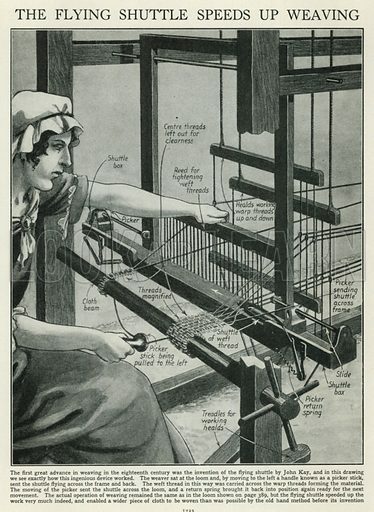 In a humble weaver’s cottage on July 16th 1704, a child was born who was to revolutionize the craft of weaving. He was John Kay, inventor of the flying shuttle and other devices for improving and speeding up the weaving process. Unfortunately, Kay made little profit from his inventions. This was due to the greed of weaving firms who refused to pay royalties for using his ideas and to the actions of his own workers who, fearing the new looms would put them out of work, wrecked his workshop. He died in poverty in 1764. This edited article about St Swithin originally appeared in Look and Learn issue number 757 published on 17th July 1976. For forty days ’twill rain no mair. But who was St. Swithin and why should he have such a dramatic influence on the weather? St. Swithin was a great church administrator and builder of churches, born towards the close of the eighth century. 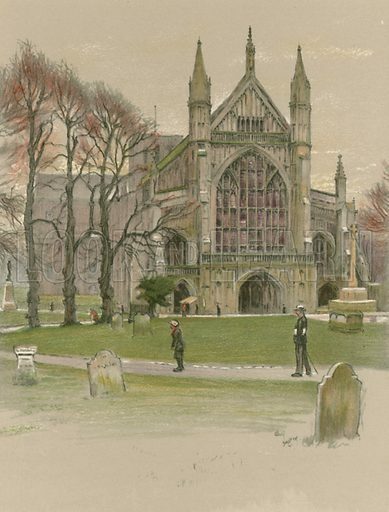 He entered Winchester monastery as a monk and eventually became Abbot and Bishop of Winchester. It was St. Swithin who, while Bishop of Winchester, persuaded the king to pass a law transferring to the church a tithe, or tenth, of the produce of the royal estates. Gradually the payment of tithes became compulsory on all estates throughout the kingdom. In 862, ten years after becoming bishop, St. Swithin died and was buried, at his own wish, in a humble grave outside the cathedral walls. But this is not the end of the story. It was long after his death that the name of the saintly bishop became associated with the weather. When William the Conqueror set about rebuilding Winchester cathedral, he decided that St. Swithin should be reburied in a magnificent tomb inside the cathedral. On July 15th 1077 the work of reburial began. Hardly had a spade been stuck into the soil of the old grave when the skies opened and a blinding rainstorm made the workmen run for shelter. It continued to rain for forty days and the reburial had to be abandoned. The rain was taken as a sign that St. Swithin did not want the fine tomb built for him. So the saint was left in peace in his humble grave, and a chapel was erected over it. This edited article about aviation originally appeared in Look and Learn issue number 757 published on 17th July 1976. Bobbing helplessly on the sea in their life raft, the men from the trawler that had broken its back on a ridge of submerged rocks, waved frantically as a plane began searching overhead. The distress radio signal, transmitted by their raft’s emergency equipment, had enabled the aircraft to “home in” on them. Suddenly, a rocket fired from the raft streaked through the black sky, bursting into a blaze of light that floodlit the survivors on the water. At once, the pilot began to descend towards the sea, aware that the floats on his flying boat would enable the plane to remain buoyant in the water while the men were helped on board. Two more lives had been saved by the versatile Canadair CL-215, a twin-engined, high wing, amphibious flying boat powered by engines of the Pratt & Whitney R-2800 series. It was built when the Canadian aircraft company, Canadair, designed a fire-fighting plane and developed it into one that had many purposes. 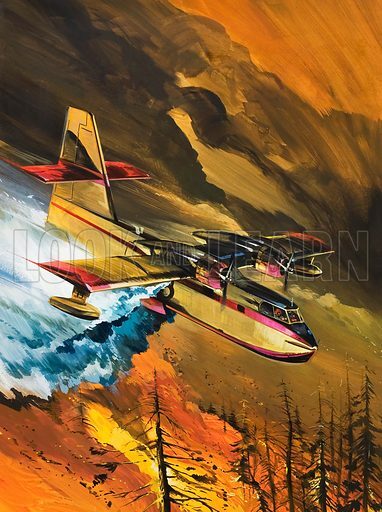 In addition to bombing forest fires with water, the CL-215 can carry people or cargo. It can be used as a fishery protection plane, for it is able to land on the water and lift fishermen to safety, or to spread insecticide. Its principal job is to put out forest fires, which can destroy vast areas of valuable timber, and threaten animal and human lives and homes. Carrying 1,200 gallons (5,400 litres) of water, which by landing on its floats it scoops up from Canada’s lakes, the CL-215 can drop its water load in less than a second. This load covers a very large area with the equivalent of 1 mm of rain.